The Old World rats and mice (called Murinae) is a subfamily in the family Muridae. It has about 560 species. This subfamily is larger than all mammal families except the Cricetidae. It is also larger than all mammal orders except the bats and the remainder of the rodents. Probably the best known genera are rats and mice. The Murinae are native to Africa, Europe, Asia, and Australia. They are the only terrestrial placental mammals native to Australia. They have also been introduced to all continents except Antarctica. They are serious pest animals. This is particularly true in island communities where they have contributed to the endangerment and extinction of many native animals. Two prominent murine human commensals have become vital laboratory animals. 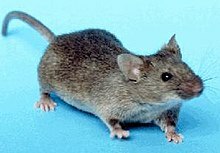 The brown rat and the house mouse are both used for medical tests. They are among a handful of animals where the full genome has been sequenced. The first known appearance of the Murinae in the fossil record is about 14 million years ago with the fossil genus Antemus. Progonomys is thought to be the ancestor of Mus and relatives, while Karnimata is thought to lead to Rattus and relatives. All of these fossils are found in the well-preserved and easily dated Siwalik fossil beds of Pakistan. Most of the Murinae have been poorly studied. Some genera have been grouped, such as the hydromyine water rats, conilurine or pseudomyine Australian mice, or the phloeomyine Southeast Asian forms. No tribal level taxonomy has been attempted for the complete subfamily. It looks like genera from southeast Asian islands and Australia may be early offshoots compared to mainland forms. Three genera, Uranomys, Lophuromys, and Acomys were once considered to be murines- Later, it was discovered that they were more closely related to gerbils through molecular phylogenetics. They have been assigned a new subfamily status, Deomyinae. Chevret P. et al 1993. Molecular evidence that the spiny mouse (Acomys) is more closely related to gerbils (Gerbillinae) than to the true mice (Murinae). Proceedings of the National Academy of Sciences USA, 90:3433-3436. Jacobs L.L. 1978. Fossil rodents (Rhizomyidae and Muridae) from Neogene Siwalik deposits, Pakistan. Bulletin of the Museum of Northern Arizona, 52: 1-103. Jansa S.A. and M. Weksler. Phylogeny of muroid rodents: relationships within and among major lineages as determined by IRBP gene sequences. Molecular Phylogenetics and Evolution, 31:256-276. Michaux J. A. Reyes and F. Catzeflis. 2001. Evolutionary history of the most speciose mammals: molecular phylogeny of muroid rodents. Molecular Biology and Evolution, 17:280-293. Steppan S.J; R.A. Adkins and J. Anderson 2004. Phylogeny and divergence date estimates of rapid radiations in muroid rodents based on multiple nuclear genes. Systematic Biology, 53:533-553. This page was last changed on 9 March 2015, at 04:10.